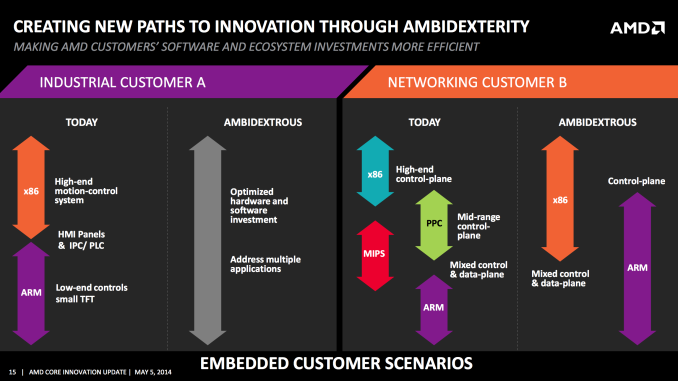 There is no way that AMD would face the "ARM"ageddon of facing their ARM competition with purely ARM designed Cortex cores. It has to have its own custom architecture to differentiate from the numerous Cortex ARM cores that will be in the market from Allwinner to POP all the way up to QCOM. 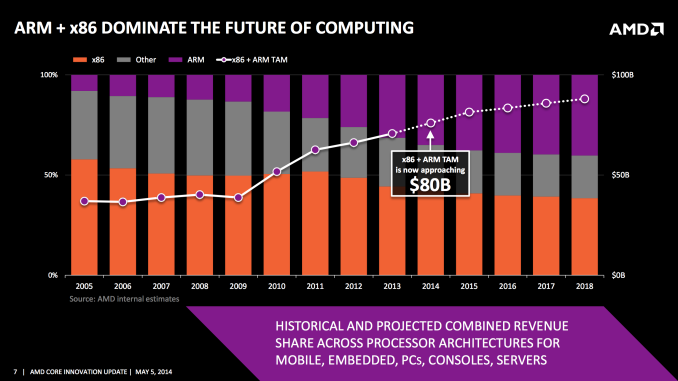 So AMD had to move to custom ARM ISA like QCOM/Apple. Else it cannot afford to compete aginst competition that would have the same technological or in some case better tech nodes than it. It can have Cortex cores as a back-up in case their custom design takes longer to materialize. See how (QCOM is using Cortex A5/A7 & in the future A53/A57 cores). In 2015 MSFT will unveil their new OS code named "Threshold". A threshold is the end of something, and the beginning of something else. 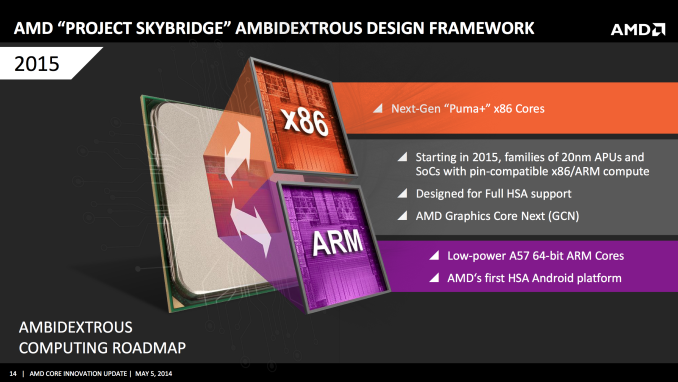 Why would MSFT continue to only make Windows for X86 ONLY, when there will be a number of ARM 64 bit chips being released in 2015? One of the main reasons that PCs are so expensive is because of Intel. Intel has caused people to believe they need a more expensive chip than necessary to do what 90% of them require. The other 10% do need a more powerful chip, but most of the additional power is graphics based. AMD is working closely with MSFT! Because of the Xbox1 custom APU from AMD, MSFT probably has a closer relationship with AMD than with Intel at this time. In fact, the main advantage of a PC over Tablet is the substantial increase in GRAPHICS power, and not in the speed of the CPU. "In fact, the main advantage of a PC over Tablet is the substantial increase in GRAPHICS power, and not in the speed of the CPU." Threshold is just a codename for the Windows 9 series of updates for Windows Phone, Windows RT, and Windows OS. It's special because it's going to integrate them all further. We already see the signs of it with the recent universal Windows app stores and universal Windows app binaries. Threshold will go further than that. Other than that, Windows will live on x86 for a long time due to backward compatibility. It's not going to disappear any time soon. Or people could use their brains, and actually read the contents of the article. Realizing they aren't putting ARM and x86-64 on one chip. They're making chips and chipset/mainboard designs that are architecture independent, but fully socket compatible.. Meaning if someone needs a x86 solution they can use an AMD x86 chip. But if they need a low power solution, they can use an AMD ARM based chip on the same base system by simply changing out the CPU. Which would effectively allow fully functional ARM based desktops, with full APU capability, etc. Unfortunately, reading other comments on here I can tell that we have a lot of armchair experts at nothing. Which fail to actually read and comprehend what was written in the article. Heh, heh, yeah I don't think people were actually thinking they were making a chip with both ARM and x86 on it (wait they already make one of those*), but they were speculating the possibility. AMD hasn't produced a single interesting processor in years.